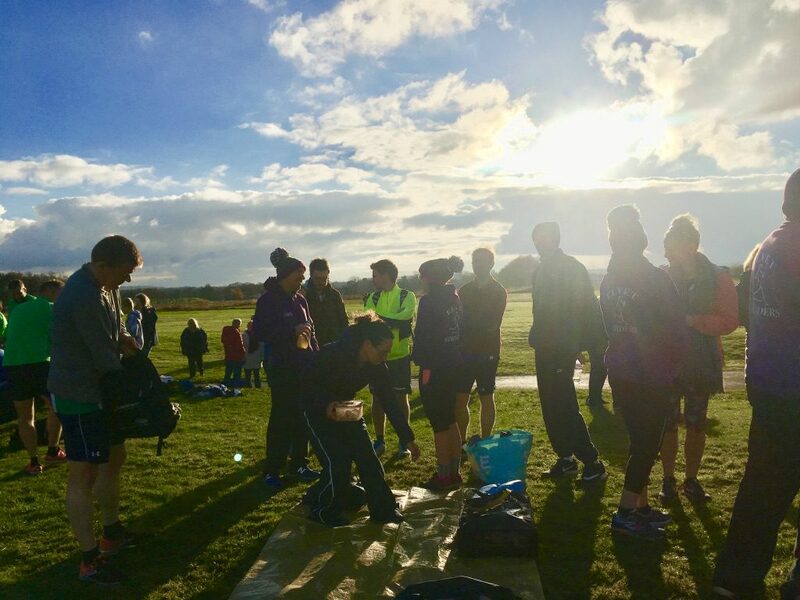 A total of eighteen Striders turned out on a sunny, slightly chilly November morning for the relays, forming the maximum allowed six teams and truly representing the club and Durham. With teams comprised of new members, road, fell and endurance runners young, and slightly less young the diversity of the club was certainly shown, with fantastic performances all around. Georgie led the senior team (with Gareth and Fiona), to a strong start, coming round to hand over to the second leg near the top of the field, with a cracking time. After a significantly slower, but a somewhat competitive time in the ‘lady leg’ (possibly 80% of the leg two runners were female), Gareth then took over to fly around and bring the team in a commendable 5th place overall. The team to watch, however, were the V60 athletes, older but seemingly not much slower as Geoff, Roz and Conrad stormed round to bring the team in 2nd place, only narrowly missing out on the win by a few seconds. Special mention must go to the individual performances here – Geoff bringing home the overall fastest V60 times of the day (not bad for a fell runner! ), Conrad coming in with the 2nd V60, and Roz taking the 2nd female V60. Something to aspire to for all those in the younger age categories! So short runs are not my thing, the feeling of running flat out and close to my limit does not appeal to me. That sick feeling of not being able to breathe nice and deep and my head screaming stop…nope not my thing. However, I am a fan of team spirit and I love it when striders come together to support each other so I decided to broaden my horizons and go for it. I’m a nervous runner before a race so finding out there were no toilets near the start line did not turn my frown upside down. How bad could this relay be? 1.6 mile of feeling out of breath and on the verge of vomiting… at least it would be over quickly. Having a look around to scout out the competition didn’t help, especially when you see the likes of Aly Dixon warming up! I felt like I didn’t belong there, trying to run ‘fast’, when we all know I’m a half marathon runner at heart. Steady plodding and deep breathing is where I’m comfortable. So… after all the overthinking, miserable face and nerves, I went on to run my fastest ever mile and I didn’t vomit!! It’s not a bad feeling over-taking people one by one and the atmosphere towards the finish was fantastic. The pain was over very quickly but the feeling of accomplishment and improvement remains. I tried something new, I surprised myself and I might have liked it a little. Just a little. I will be back next year and I will be hunting down a new fastest mile PB!! Norman Woodcock relays from the almost sharp end. Some people are put off by the fast, flat, tarmac, relays. Not me as it’s everything I love about our sport. I appreciate other forms of our sport and have taken part in them all. I recognise their value, attraction and training values for sure. You need to do what you love and enjoy, otherwise, you end up doing no running at all. Find your passion for running and commit, that’s the best advice I’ve ever received. 1 week earlier I’d run a sub 2:55 marathon experiment using heart rate, so my expectations pre-run were low. 6 teams were soon formed, with me, George Hebdon and Fiona Brannan in my team. We placed 6th on the day out of over 100+ teams (FB edit – upgraded to 5th in the latest publication of Athletics weekly!). A very impressive performance and a marker in the sand for future teams for sure. So what was my race like? Stood round in the pen, shot off like a sprinter then into my familiar groove of almost mile pace. I swapped into K pace splits for the short distance, better feedback. I love having people to chase, and I managed to get past a few but left it too late to catch more. A fantastic experience and the big smiles all round showed that others thought the same too. The team aspect of relays can’t be understated; running can be a solitary sport at times. So we need these days, a reminder that we are a team, a family and a fantastic club.